Most General Assembly events will be held in the Rhode Island Convention Center, 1 Sabin Street, Providence, RI 02903. Google Map. The theme for General Assembly 2014 is Love Reaches Out. Religious life in America is changing dramatically and rapidly. Fewer people are identifying with specific denominations and most mainline religions are losing members in droves. People now find many outlets and places of engagement for their spiritual lives. Current studies of faith in America show that there is a movement toward a liberal, fluid kind of faith that doesn’t fit with traditional denominational identity and structure. We already know that for every adult member of Unitarian Universalist (UU) congregations, there are at least three non-members who also consider themselves to be Unitarian Universalist. A core purpose of our faith is to help people grow in spirit and in service. We believe that our faith provides a path for each of us to unlock our transformational capacity to serve the world with love. We want to expand our faith not just to grow Unitarian Universalism, but also to better achieve this transformational purpose. 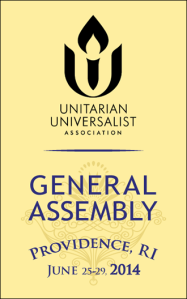 Therefore, the General Assembly Planning Committee, the UUA Board of Trustees and the Administration want the General Assembly in 2014 help our association live into a future where our “Love Reaches Out” to share our faith both within and beyond our congregations’ walls.